“This…hon…here.” I kneel in the trench, scraping away at the dirt with my trowel. Teaching digging, teaching how to see. “Tamam? Okay?” But I realize that my students and/or workmen are not looking at the dirt, they are not looking at the texture changes, they are not trying to discern the transition from the Byzantine to the Mamluk. One of the dirty, ragged cuffs of my long-sleeved shirt has ridden up, revealing faint swirls of color on my skin. My tattoos are faded, obscured by a salty rime of evaporated sweat. Later, when they are more comfortable with me, I expect questions about the tattoos. How many do you have? How long have you had them? How long did they take? But…you are a woman? Over the years my answers to these questions have changed in tenor, but I have settled on the explanation that has the most resonance: they’re traditional in my culture. Fictive kinship, or kinship that does not rely on marital or blood ties, is a classic, though dated and thoroughly critiqued concept in anthropology. Kinship is obviously relative, if you will forgive the wordplay, and ties of love and obligation can bind through a near-infinite amount of variables. I think of kinship in the active tense; I kin to people, I understand, empathize and appreciate some people more than other people. My kin tend to have a lot of tattoos, drink cheap lager, and a deep reverence for live music, though they’d surely find the exception to any such proposed definition. I learned a sense of kinship through punk; I learned to find others who participated fully and passionately, who were politically minded, vocal, contrarian, who spoke plainly through microphones, records and zines. I want you to know people who laugh too loud/And have to get drunk to find the right words/And can’t sleep ’til the colors are just right. I carried this sense of urgency and community with me, nearly 2,000 miles away to graduate school, ready to shake the world. I very quickly learned to stick my nose in a book and to hide my tattoos. I missed my kin horribly. I had colleagues now, and they were not interested in listening to records or going to shows and even if they were it was something to do, not something you were. I did not have imposter syndrome, I had infiltrator syndrome. Before my MA exam I slid my headphones over my ears, locked myself in the department bathroom and listened to the irreverent roar of the X-Ray Spex and told myself that no matter what happened, academics could not take this away from me. No matter how they saw my work, my aptitude, my ability to theorize and categorize, this piece of me would stay strong and true. This is still true. Graduate school provided fire and forge and I came out very different on the other side. The conservatism of punk, the inflexibility and strident nihilism was no longer feasible. My tattoos faded under the hot sun of excavations and I met a whole phantasmagoria of people who took life in their teeth. I am the animal/With no pockets in my pants. Still, I kept the possibly quaint ideal of kin and kept practicing what I felt was the best practices for a punk archaeologist. Membership in a community and participation in this community. Building things–interpretations, sites, bonfires, earth ovens, Harris Matrices–together. Foregrounding political action and integrity in our work. Think about the kind of revolution you want to live and work in. What do you need to know to start that revolution. Demand that your teachers teach you that. The Young Lions Conspiracy, led by Big Daddy Soul (né Tim Kerr), was a minor movement in the garage punk/Austin scene that called for “integrity, soul, attitude” in every aspect of life. He asked, “What are YOU doing to participate?” I have not been to a punk rock show in a while, and my tribe of tattooed drinking punks have changed, moved on, and do not need to be used to typify an attitude or remain static in their decades-old resistance. They too have forged their own lives; they own homes, have children, even changed political allegiances, but we have the same scrawls on our skin, even if I’m half a world away. And I still have my Young Lions membership card tucked away in my wallet. This. This is traditional in my culture. Trying to practice, commenting *on the blog* rather than elsewhere. Thank you for the piece, I had a (slightly) different fictive kin group but I think that they are a very important part of growing up for many archaeologists, and perhaps we are drawn to fieldwork as place where similar bonds may be forged. How do we hold these multiple cultures *within* ourselves and what do we do when traditions clash? Excellent post. 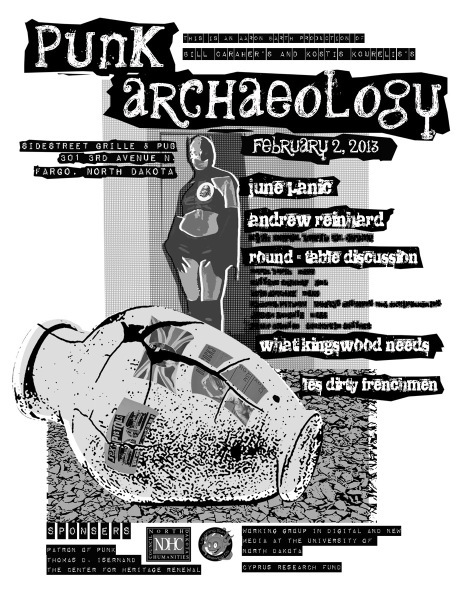 Digging in the dirt as deep as one needs to go in order to find what counts has got to have something to do with punk soul, exhuming the ancient, deeper kinship we have with the world. The tats are leys of that work. Next Next post: …and then there are the days that you spend with your head down a toilet.